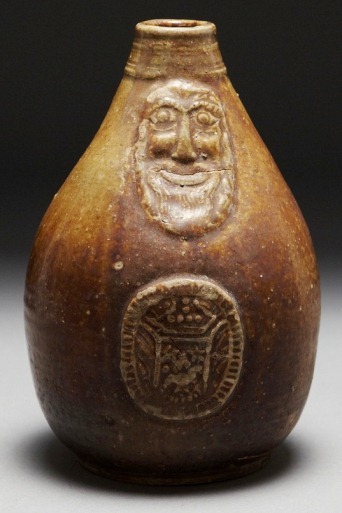 Your new page on “Ring Jugs” has piqued my interest regarding the ring in beak motif of the Ringkrug. I would like to hear what you have found. I’m a newbie, but prior to reading your page I had just assumed that the ring was some sort of stylistic holdover (since it’s only seen on the historismus style) and didn’t have a function. Also, I am a bit befuddled about the word Ringkrug. 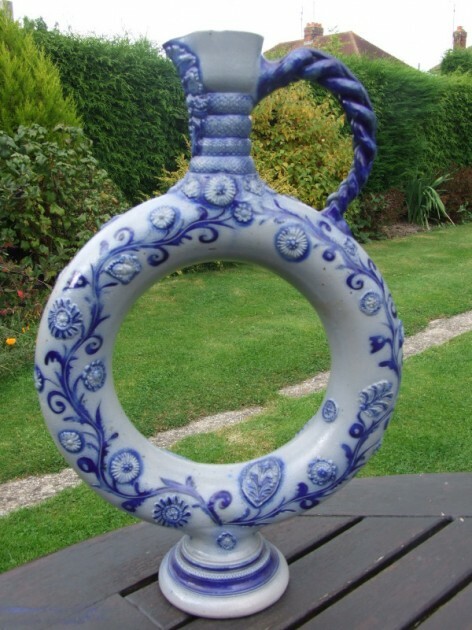 I have had some tell me that the word should be used for any jug that has a ring in beak near the pour spout. I have also seen people using the term Ringkrug for any jug that is toroidal in shape (or has the pair of orthogonal tori). In addition to Ringkrug, I have come across the words Flachkanne, Ringkanne, Wurstkrug, and Flacher Ringkrug. So, do you know of reasonable terminology to differentiate toroidal jugs (with or without ring in beak) from jugs that have a ring in beak (though may not be toroidal)? 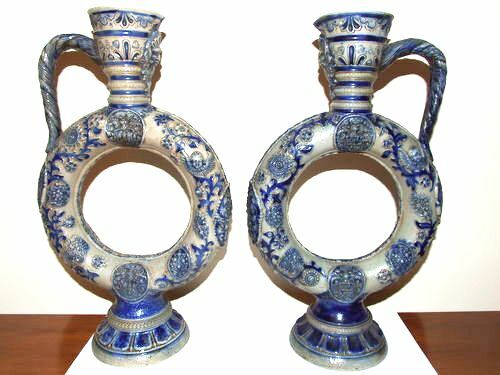 Is there a specific word for those jugs shaped as two perpendicular tori? 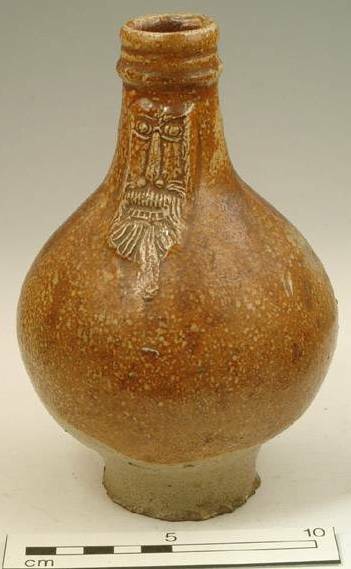 How about the jugs that are flat drum-like in shape (like the Ringkrug with the middle hole filled-in)? 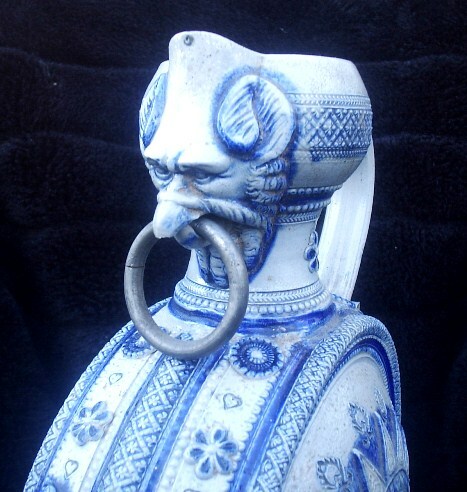 Though I’m a new collector, I am interested in these jugs and would gladly read anything that you had the time to share. Finally, thank you for the work that you put on into your site. English language information is tough to come by, so your page has been very helpful (and fun to read – I like your unvarnished opinions). I hope to soon attend a Gambrinus Chapter SCI meeting, perhaps I can say “hello” then. And thanks so much for your email. Well this sounds like it could be an interesting exchange of ideas, and perhaps a challenging exercise for me to explain my views. I do not consider my self to be an expert. 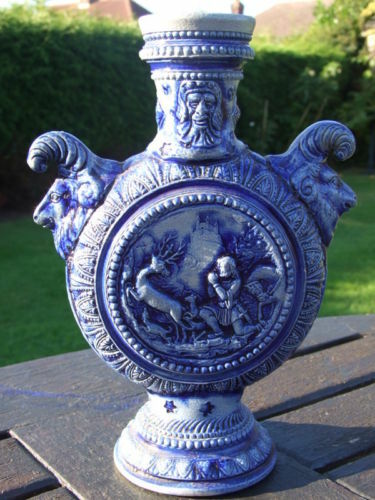 As I have said many times I am just an old collector with a tremendous interest in the history behind the stories of all these old European drinking vessel, some of which I have studied a lot, some not too much. I glance at “Stein Talk” periodically just for “shits and giggles” and saw your posts there. ………… I do not participate in the discussions there as “…………………………………………………….” I do have a comment on what (the SCI answerer) said to you about the “Ring Jugs” which I will get to later. Anyway, back to the point. After that school graduation, I had asked and was assigned a tour at the Surveying Air Force Flight in Germany at Ramstein AFB. While there we were on “The Economy” about every other month and I learned a lot about German culture, the beer / white wine, the young women and had some good times there …….until my dad died of a heart attack…..and so I had to leave early and come back to the USA to help my mother. She had been disabled due to a massive car accident where the car she was riding in slid under a broken down 18 wheeler on her way to Richmond. I had only bought one stein there but had considered buying a 1/2 liter porcelain “Post War” stein (also called “Cold War” steins now) but put what little the money I had at the time into a beautiful “Grundig” Stereo and Radio Console. 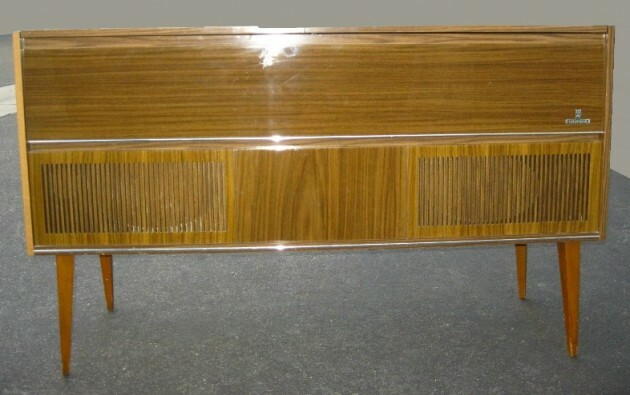 My pride and joy German made stereo console of 1961 looked very close to this, only a better design if I recall. So after I got married and my wife and I and my baby girl were just browsing at a local antique shop; I bought me first two lidded steins. The rest as they say is history!! The rest of my life has centered around these “damn things”; collecting, studying and talking about them! And I guess I owe all the gratitude to “Old Snaggel Tooth,” my Plane Geometry teacher. 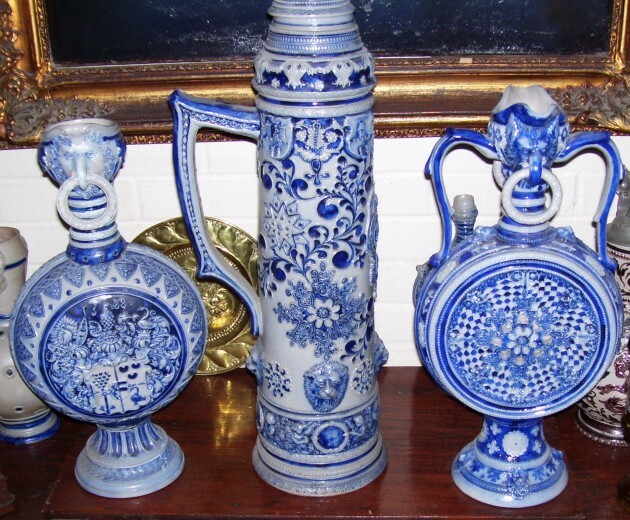 Okay… now onto “Ring Jugs.” = The German word for Jug (as well as our”stein”) is also Krug. I have had some tell me that the word should be used for any jug that has a ring in beak near the pour spout. I don’t think calling them ring jugs applies as your SCI contact suggested. 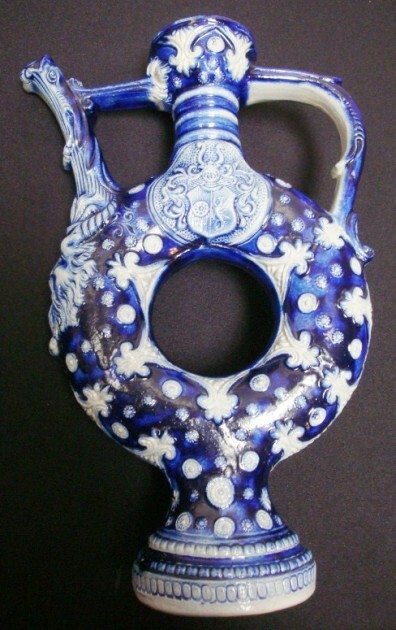 A replaced metal ring in the beak of this jug. A good match and well done but still considered repaired. These type faces are not gargoyles, they are called grotesques! Gargoyles are rain spouts! And if so, what then should we call these if the ring has been broken and missing? So that comment makes no good reasoning to me. A very well done R. Hanke ( Westerwald)example, but missing the ring in it’s mouth. What should we call those now called “Double ring jugs”, along with just the single rings, that did not ever have rings in their beaks? 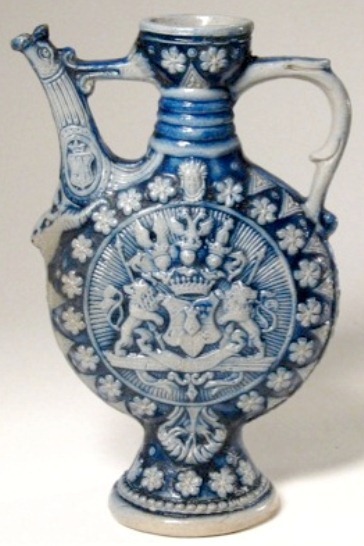 An older Westerwald ring jug – no grotesque this time, but a “Bartsmann” type face. 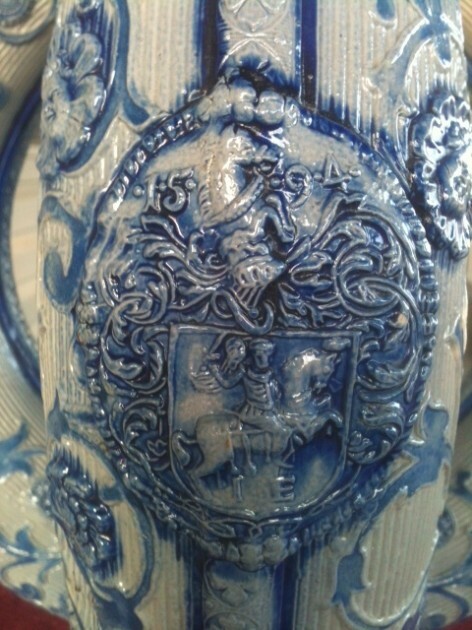 Another from the 17th century, this one with no ‘City Arms’ on the body . Westerwald Ca. 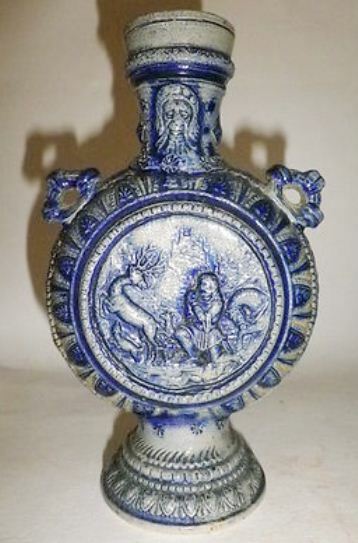 1880, 8.5 inches tall. No face on it. 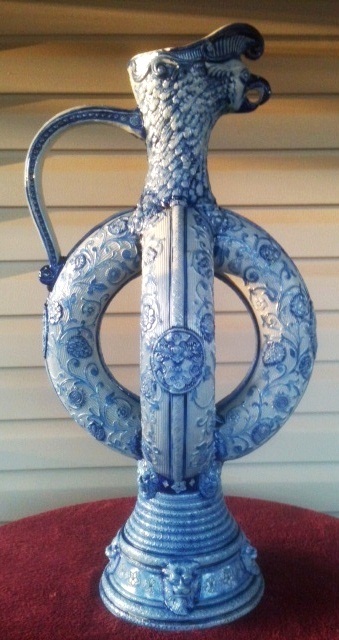 Another variety of ring jug, a smaller server with spout, only 9 inches tall. I think it was made in Regensberg. Notice the face is now under the spout. My “blind eyes” definition (up to now and the development of this page has been any jug that is tubular and circular, made with a hole in the middle of it so the beer / wine has to travel around the outside as in a ring doughnut was the defining point. And another Glass one, by Eggerman. “BLIND JUSTICE” – A Gerz No .286. Amphora [?] These are very large. This style with the crooked handles is called a “Vasen” in some of the catalogs, but it could use it as a wine server I suppose. Left and right, two later day Westerwald’s made by R. Hanke. [L] has the 1599 date on it. One cannot tell if these are truly ring jugs as the center is covered [FWTD] Center stein is by Hanke also. In addition to Ringkrug, I have come across the words Flachkanne, Ringkanne, Wurstkrug, and Flacher Ringkrug. I think what most of these words refer to are the much smaller jugs that can be single handed carried about. Some of these are made after the old “Pilgrim’s flasks” that have rope attachments on the upper body for over the shoulder or belt carrying, although most of those I’ve seen have had the center covered over. Flask: Westerwald about 6 inches tall, with the St. Hubertus scene in relief. Ca. 1900. 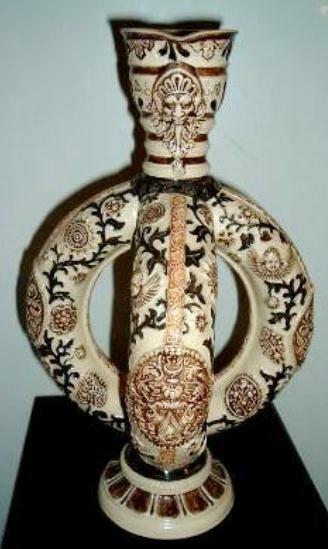 Flask: This one, about 7 inches tall, with the same St. Hubertus scene has molded loops to attach the carrying rope to. Ca. 1880. Both have a small “Bartsmann” face on the neck. 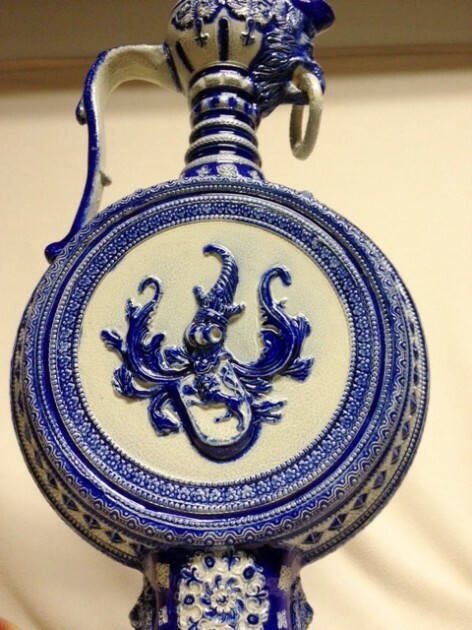 A Westerwald spouted flask. 7.2 inches tall. Unknown maker. Dave, I really have no idea what “Wurstkrug” refers to. 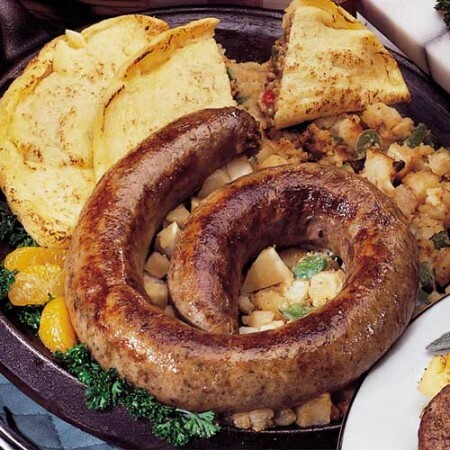 Google’s German interp says: “sausage pitcher.” It may just be a made up name. 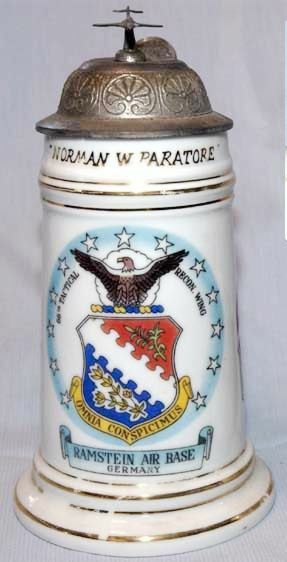 Note: My good friend and fellow Gambrinus Beer Stein Collector’s Club member Judy Stuart had this to offer once she saw the draft of this article. 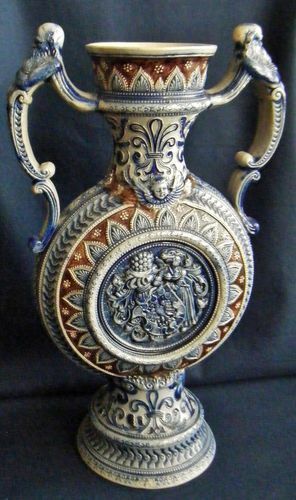 After all this thought process and discussion**** and as there are so many variations to take into account I now think it would be simpler just to call every “Westerwald circular server” a “Ring Jug” and be done with it [?]. I may turn this discussion into a page on my site, if you don’t mind ” …..” Your thoughts about it all are most welcome! **** took me about 2.5 hours to type this with two fingers, edit it somewhat and find all the photos. As I said, all a very interesting exercise. Thank you for taking the time to write such a nice reply. 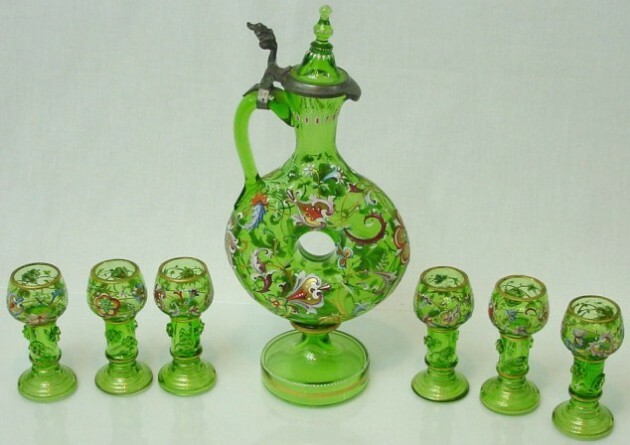 I enjoyed hearing how you came to stein collecting. I, too, probably owe my budding interest to the influence of Uncle Sam. My parents were stationed in Heidelberg in the early sixties (just before I was born), so I grew-up in a house that had steins and cuckoo clocks. I guess that as I’m getting a bit older, I find something familiar and comforting about steins. 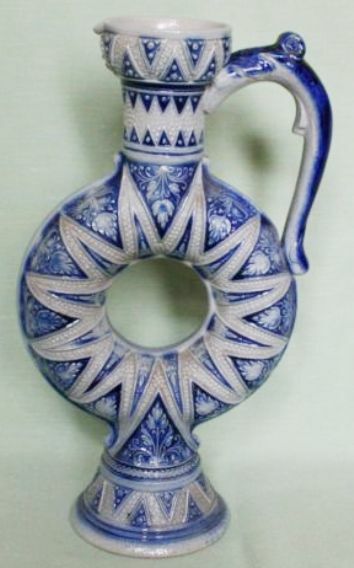 I also like using “double ring jug” in the way that you did – a pair of orthogonal tori (I’m a mathie for the Navy, so I’m sorry that I can’t get away from the word “torus”. This usage also seems fairly well-established. I thought that it was somewhat interesting that there seems to be variation in whether the pour spout aligns with the body or is perpendicular to it in ring jugs that I’ve seen (in photos). Probably no one cares enough about this minor variation to assign different names for this. 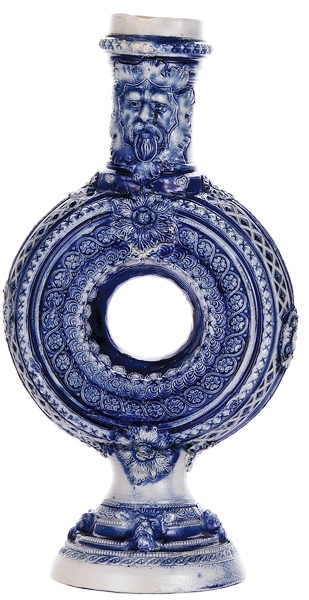 If I got to pick a name for the “circular servers,” I would love “drum jug,” as this name certainly captures the shape. Sadly, I don’t think that people are lining up waiting my opinion on these things. 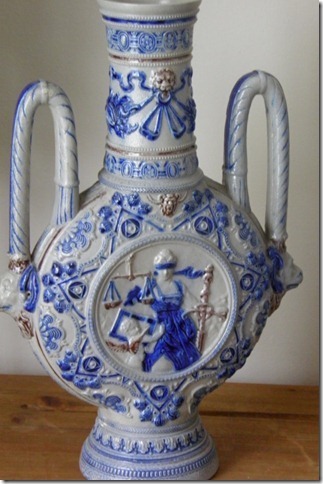 In the photos that you attached, I seem to recall that the book on Hanke gives a German name to the “drum jugs” with two handles (especially the style of the Gerz “BLIND JUSTICE” that you attached). If you’re interested, I can look it up tonight when I get home from work. That being said, the book also uses the word “Wurstkrug” to describe some of what we agree are “ring jugs” (i.e., Ringkrug). I’ve never seen that word before (and apparently neither have any other collectors), so I’m not exactly filled with confidence in the authors’ descriptions. Thanks for the help with the word Flach/Flacher. (= Flasche.) I had German for one year in college, but that was a loooong time ago. If that translates to flask, then I like using it to indicate the smaller sized “ring jugs” (i.e., Flacher Ringkrug). Finally, please feel free to incorporate what you’ve written into a page (either with or without my name). I am not just blowing sunshine when I say that I’ve read a lot of what you’ve written and have found it very enjoyable/useful. I’ve bought all the standard books on stein collecting, and have to say that none of them are all that good. They are way too concerned with “retail value” (something that’s generally obsolete within a year after the book is published) and have far too little history and information on how the steins were made. I’m guessing that some of the German books are much better in this regard, but I don’t know how to read German. Again, thank you for everything. I am being sincere when I say that I hope we can one day cross paths.